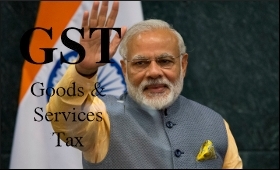 Prime Minister Narendra Modi on Monday reviewed the status of Goods and Services Tax (GST) roll-out from July 1 and described it as a "turning point" for the economy. "The Prime Minister asserted that the implementation of GST from July 1 is the culmination of the concerted efforts of all stakeholders, including political parties, trade and industry bodies," an official statement said here. At a review meeting with officials here, Modi described the GST regime as a turning point for the economy, unprecedented in history. He said that the creation of 'One Nation; One Market; One Tax' would greatly benefit the common man. The Prime Minister directed officials to pay maximum attention to cyber-security in IT systems concerned with GST. The meeting, which lasted for over two-and-half hours, was attended by Finance Minister Arun Jaitley and top officials from the Ministry of Finance, the Prime Minister's Office and the Cabinet Secretary. In the course of the meeting, the Prime Minister specifically reviewed aspects of implementation such as IT readiness, HR readiness, training and sensitisation of officers, query handling mechanism, and monitoring. Modi was informed that GST systems such as IT infrastructure, training of officials, integration with banks, and enrolment of existing taxpayers will be in readiness well in time for the July 1 implementation date. The GST Council on Saturday completed the exercise of bringing all items under a four-slab tax structure with gold to be taxed at 3 per cent. The GST Network (GSTN) made a detailed presentation at Saturday's meeting on their IT preparedness for implementation from July 1.